Do not you think that the rice nursery is the one that ditches, raises the nursery, and makes it?I also thought like that so far. However, I lowered the nursery devising it. Because the water management in the rice nursery became very easy as for the result, I introduce it. The house in the vicinity ditched to the rice nursery on this figure, the nursery was raised, and past pool raising was made. There was not a doubt in this street for years and either it came also in my house. However, it often had a hard time in the water management of the seedling in this method. It was difficult to need a lot of water at time when water was not so abundant, and to always save water. Then, I devised it a little last year. In a word, the nursery was lowered little ditching it to surroundings of the nursery. The nursery part was lowered more than another, and water made water go to the seedling even a little as shown in figure under this figure. The rice nursery in my house is in the place in the house where it is soon in by the side, and doesn't close water from the river. The water of the valley used the water that began to blot slightly. Thus, it came to be able to cover the water of the rice nursery only by the water that had begun to blot. In a word, the water management became quite unnecessary. Excess water made it go out without permission. The nursery is lowered and the bottom is made the horizontal. 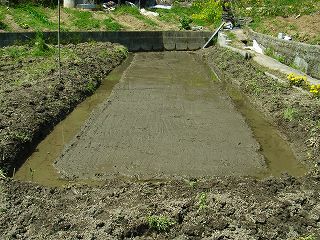 The place of the size necessary for the position made a rice nursery is secured. The place of about 2m in length about 10m and width was dug down for my home as shown in this photograph. The horizontal is understood well when doing after water is put in a little after it cultivates it with the cropper. To close the hole of the mole, you might knead a little though it is not necessary to knead especially because planting rice is not done. The foul dung and the fertilizers such as cowcakes and the rapeseed dregs are moderately scattered as a fertilizer. The soil is made to settle down because it leaves just as it is for about one week and it hardens it after this. Because of making it one week later next work of depending. Pot is displayed to the rice nursery. The excavation seat (seat in a black reticulation) is paved in the nursery. This is because the pot seedling is made easy to peel off. After the paddy is scattered on the pot type seedling, the pot type seedling is displayed to the rice nursery. They are made to prepare two boards of the area of as many as two pot seedlings, to put on the pot seedling, to get on, to put all weight, to suppress evenly, and to become familiar. The reason to use two boards is that the other board can be moved when it gets on on one board. You may not get off below separately. Afterwards, it covers with a white Takeshi seedling seat (raising seat) for waterfield rice after the frame of the plastron for the tunnel in the raising seat is put on the seedling. 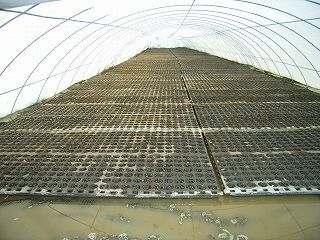 Water is put in once on the seedling, water is decreased a little next, and the seedling is managed by water in this photograph level following. You seem should reduce the water of the ditch after this. It doesn't germinate even if there is a lot of water or it is few. Let's sometimes remove the raising seat and confirm the state of the pot seedling. This photograph is the one (displaying box and putting in the tunnel in the raising seat). The soil is put, and the seat is held with the tree and the bamboo so that the raising seat is not skipped because of the wind. The seedling has grown up in the pot type rice nursery. The Takeshi seedling seat (raising seat) does white or the silver color. The temperature in the rice nursery doesn't rise abnormally because it reflects the light. The seedling is burnt in the vinyl seat of the transparency. 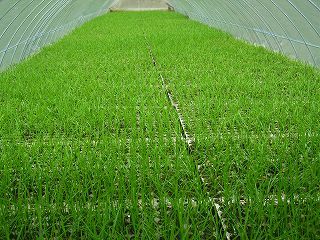 I am burnt of the seedling by the use of the vinyl seat without knowing this thing in the previous year, fail in the management of the rice nursery, and the seedling has not grown easily. It will go well this year. After the rice nursery is built, this photograph is in the state of the seedling after about three weeks. Thus, the other side might not grow up quite well to be good when seeing from the edge. Let's remove the raising seat even if it is troublesome and see the whole. I have failed without doing this.